Butterflies are perhaps the most beloved of the arthropod inhabitants of our gardens. They’re big and beautiful, slowly moving from flower to flower or flapping and gliding overhead. The flora at BBG are host to many species of butterfly, either as caterpillars or as adults, and you’ll see them all around the Garden from spring through late fall. Butterflies belong to the order Lepidoptera, which also includes moths. The name means “scaly wing,” and if you look very closely at a butterfly’s wings, you’ll see that their color pattern is made from many tiny scales. 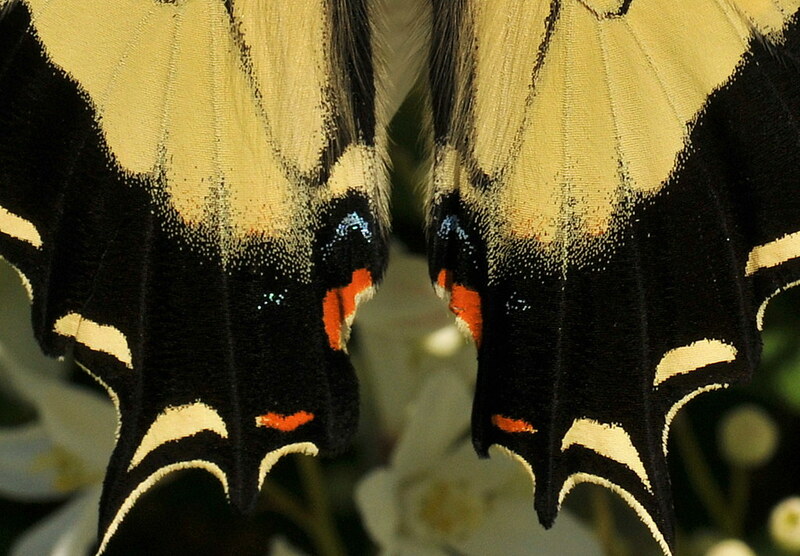 The scales are visible in this close-up of a swallowtail. While there are fossils of lepidopterans from the Jurassic period, roughly 200 million years ago, butterflies are relatively new, with the oldest fossils dated to about 50 million years ago. Since that time, some characteristics have evolved that can help you tell them apart from moths. Butterflies have antennae with a clubbed or hooked shape, while moths generally have feathery antennae. At rest, butterflies tend to hold their wings together over their body, whereas moths generally spread theirs out flat. Lastly, butterflies are diurnal—active during the day—but moths are almost all nocturnal. The tiger swallowtail (Papilio glaucus) feeding on Joe-pye weed in the Native Flora Garden, above, shows all these traits. 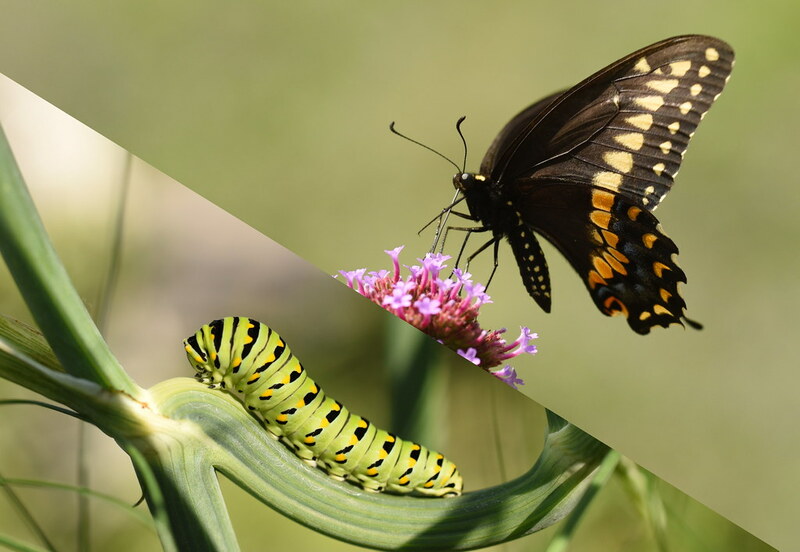 Butterflies undergo a remarkable transformation from crawling caterpillar to flying adult. This black swallowtail (Papilio polyxenes) spent several days as an egg, then hatched as a tiny, spiny, black caterpillar. It then spent a couple of weeks eating voraciously, molting several times along the way, until it reached its final instar, or larval stage, above left. It would have then formed a chrysalis, suspended from a plant stem, to shelter it while it transformed into an adult. The transformation typically takes a couple of weeks. Late in the season, though, the larvae will actually overwinter in their pupal state. 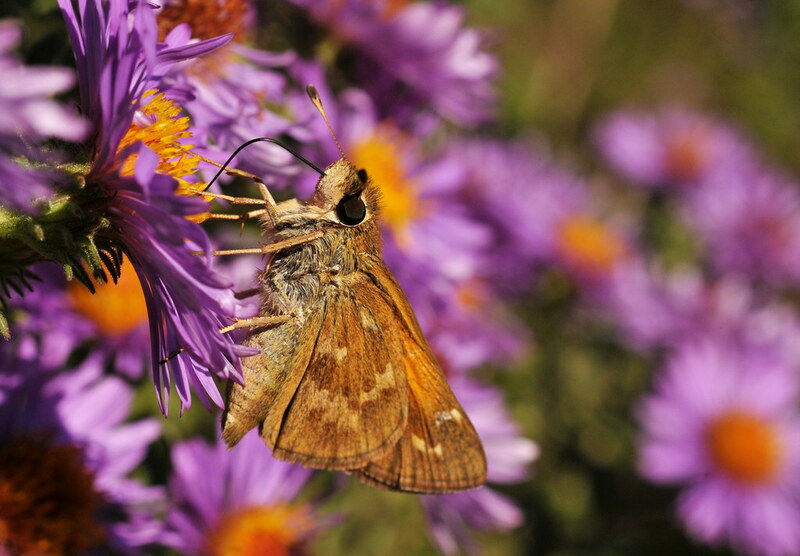 Adult butterflies, like this grass skipper (family Hesperiidae), feed primarily on nectar from flowers, though they will also eat rotting fruits. Flowers do not want to give their nectar away for free, though, so they keep it deep inside. In the struggle to reach it, the hungry visitor may pick up or deposit some pollen. Butterflies have evolved a long proboscis that allows them to reach the nectary. The proboscis is kept curled up under the head when not in use, and a series of muscles uncoils it while feeding. Above, you can see it extended. The big butterflies like swallowtails and monarchs are easy to appreciate, but BBG is teeming with smaller butterflies that are also quite beautiful. 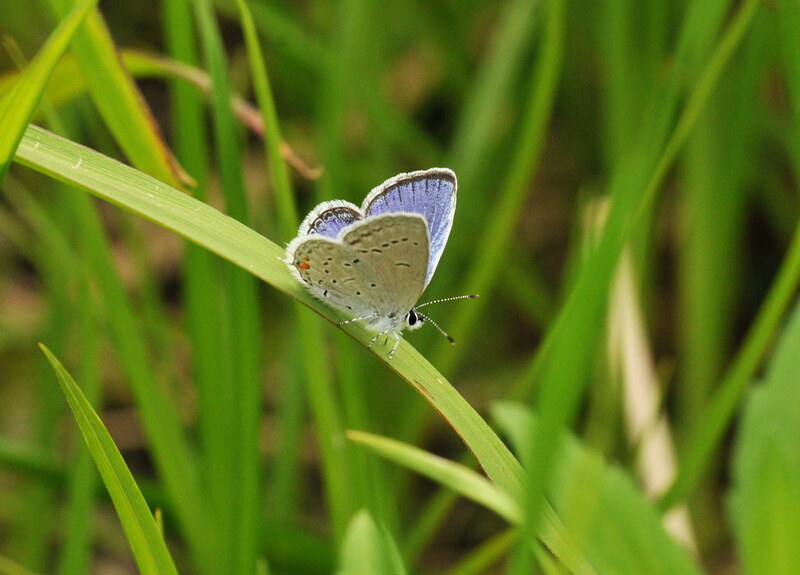 This eastern tailed blue (Cupido comyntas) is one of the smallest, about an inch across. 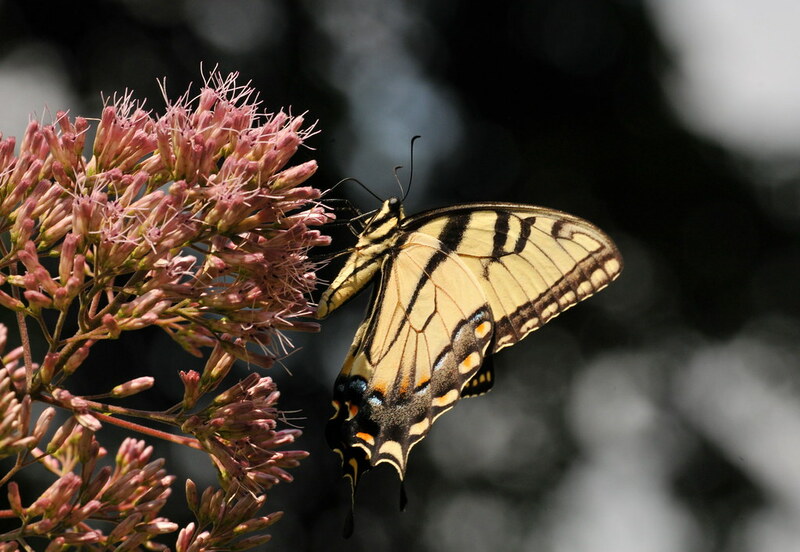 In comparison, the giant swallowtail, the largest butterfly in North America, can be over six inches in wingspan. It can occasionally be seen at BBG. This monarch butterfly (Danaus plexippus) was resting between meals. A large, slow-flying insect like this should make a tasty meal for a bird, but these creatures seem to go about their business with impunity. This is because predators have learned that the bright coloration serves as a warning, called aposematism, that the insect is poisonous or unpalatable in some way. 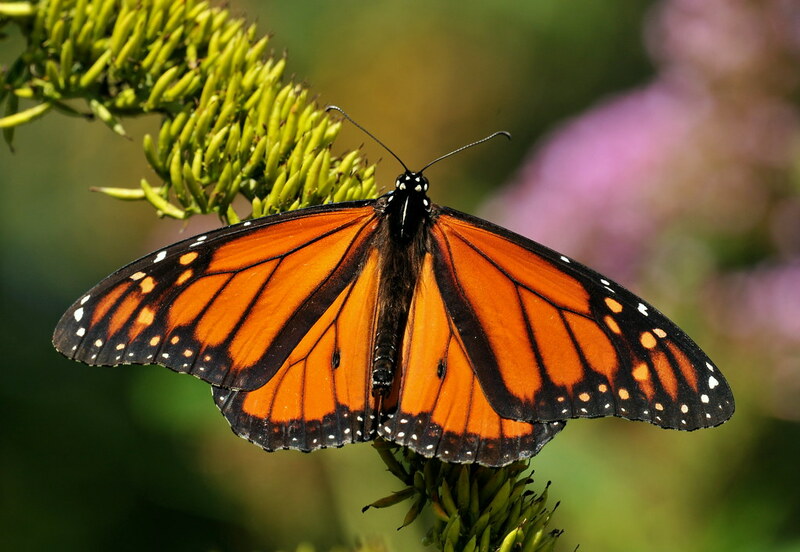 In the case of monarchs, this is due to toxins from milkweed, stored up during its caterpillar phase. However, some aposematically colored butterflies, like the black swallowtail above, are not toxic at all. In a process called Batesian mimicry, they have evolved to resemble another species—in its case, the pipevine swallowtail—which is, in fact, poisonous.